Organic apricot fruit spread; non-sugar. Containing organic Sancastrese and Palombella apricots, this spread is delicious on bread or used in yoghurts. It also great in tarts and cakes, and is a perfect accompaniment to ricotta and mascarpone cheeses. One of the first companies in Italy to adopt organic farming, Rigoni di Asiago is a leader in organic spreads. Its three main brands, Mielbio, Fiordifrutta and Nocciolata, are designed to be flavoursome, healthy and eco-friendly. A leader in Italy’s organic food movement, the company also cares about people and nature, throughout farming, processing and marketing. It provides favourable working conditions, and uses recycling and renewable energy in its operations to reduce its environmental impact. The story of Rigoni Di Asiago began about 100 years ago, when Rigoni grandmother Nonna Elisa started beekeeping in the Altopiano di Asiago, a mountain plateau in north Italy. Word soon spread that her honey was the best in the area and, by the 1930s, Apicoltura Rigoni was a household name in Italy. The company became the first to introduce mono-floral honey to the Italian market and to adopt organic methods, changing to its name of today, Rigoni di Asiago. All raw materials are sourced from regions where soil is constantly monitored to guarantee no contamination from harmful chemicals or other pollutants. Rigoni di Asiago is committed to offering quality ingredients and genuine flavours. Ripe fruit is selected, washed and frozen within hours of being harvested. Low-temperature processing methods pr”serve nutritional qualities of the basic ingredients as much as possible. An in-house lab runs quality checks at each stage of production from cultivation to packaging. 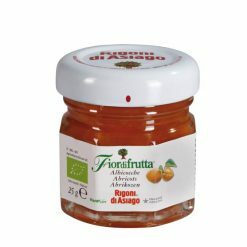 Fiordifrutta has been the leading brand of fruit spread in Italy since 2006. Prepared with organic fruit, picked when ripened, it is a distinctive light preserve produced without citric acid. It contains only fruit and concentrated apple juice, providing a completely natural, healthy, low-calorie preserve. Fiordifrutta is processed at a low temperature to preserve the nutritional properties of the fresh fruit: vitamins, minerals, anti-oxidants and fibres. It has a low glycemic index and is gluten free. Fruit spread is also known as jam or jelly in other regions.